The four-deck MS Amadeus Symphony has 65 standard cabins, nine suites and two solo cabins; highlights are the putting green and small salon. Austrian-based Amadeus by Lueftner Cruises sails Europe's rivers, including the Danube, Rhine, Rhone, Main and Saone onboard a relatively young fleet. The line touts its superb dining experience and quality red and white wines, which are complimentary (and "free-flowing") with every dinner onboard. Dinners are served in five courses, but if that doesn't fill you up, midnight snacks are also available. Boats feature modern, elegant decor, and activities -- think oversized chess boards, shuffleboards and walking tracks -- that will keep passengers busy during rare downtime. Musicians perform live daily. Compared with other river lines that ply the same waters, Amadeus offers a more moderately priced, a la carte cruising experience. Excursions can be purchased individually or as part of a variety of packages. Packages cost less than booking each excursion individually. Passengers can use the line's complimentary bicycles while ashore. All excursions come with wireless audio guides. Amadeus focuses on environmentally sustainable cruising and even offers cruisers a chance to offset their carbon footprints by paying an additional 2 euros per person per day, which goes toward U.N.-sanctioned projects aimed to benefit the environment. English is the primary language onboard all of the boats in the fleet. On Amadeus, fellow passengers are likely to be experiential-minded. They're well-traveled, somewhat older and generally casual. Passengers tend to value getting involved in authentic experiences rather than more passive touring. They prefer shaping their experiences, which focus personal service and comfort. Passengers tend to be in the 50-plus age bracket. It's rare to see children onboard. 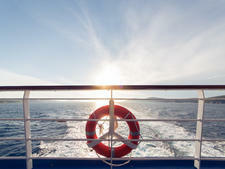 Amadeus' fleet will reach nine with the 2014 additions of R.V. Irrawaddy Explorer, which will sail the Irrawaddy River in Burma, and the R.V. Mekong Navigator, which will sail the Mekong in Vietnam and Cambodia. With 28 cabins, Irrawaddy Explorer will be the smallest ship in the fleet (187 feet long). Mekong Navigator (229 feet) will have 34 cabins. MS Amadeus Brilliant (built in 2011), MS Amadeus Elegant (2010), MS Amadeus Diamond (2009), MS Amadeus Princess (2006), MS Amadeus Royal (2005) and MS Amadeus Symphony (2003) are virtually identical: Each measures 361 feet long and comes in at 1,566 tons. The number of cabins on each ship ranges from 72 to 80. All cabins measure either 161 square feet or 236 square feet for suites. The newer builds generally offer more suites than the older boats. Each features four decks: a sun deck, and three passenger decks named after Austrian composers (Strauss, Mozart and Haydn). The line introduced the biggest member of its fleet, MS Amadeus Silver (443 feet), in Spring 2013. Silver offers 78 standard cabins (172 square feet) and 12 suites (258 square feet). Like its European fleetmates, Silver has four decks. 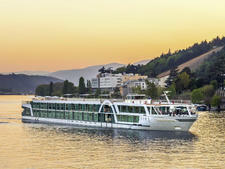 Amadeus' itineraries run between five and 15 nights and visit ports along Europe's most-popular rivers. 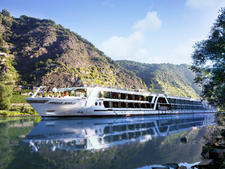 Highlights include Christmas market cruises along the Danube and New Year's Eve cruises on the Rhine. Its 15-night options highlight the Danube or provide breadth -- 2,000 kilometers (about 1,200 miles) of sailing through Europe. 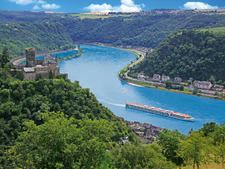 Passengers who also happen to be music lovers will enjoy the line's eight-night classical music theme options along either the Danube or the Rhine. Amadeus also offers seasonal tulip cruises through Holland. 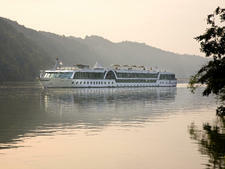 Beginning in 2014, the line will offer more exotic itineraries to Cambodia and Vietnam (eight nights) and Burma (10 nights).